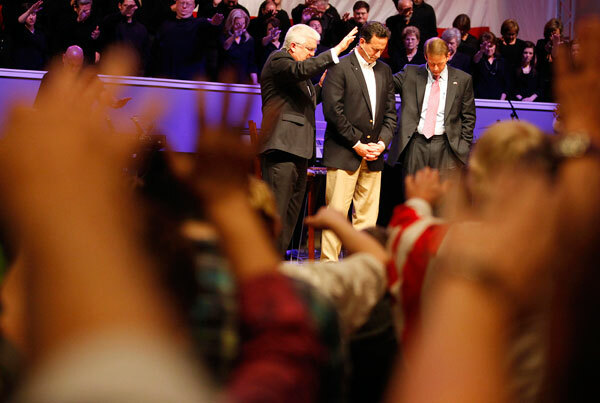 Young people are turning away from churches because they associate Christianity with Republican politics, a study reveals. Political science Professors David Campbell (University of Notre Dame) and Robert Putnam (Harvard University) published their findings, "God and Caesar in America: Why Mixing Religion and Politics Is Bad for Both," in the March/April edition of Foreign Affairs. Campbell and Putnam also wrote American Grace: How Religion Divides and Unites Us (2010), which was recently released in paperback. For that book, they have been surveying the same group of people from 2006 to 2011. The same data was used for the Foreign Affairs article. One of the most surprising findings from the data they collected, Campbell said in a March 13 interview with The Christian Post, was that people are driven away or toward religious involvement because of their political leanings. In particular, those who are politically conservative, or Republican, are more likely to become churchgoers and those that are politically liberal, or Democratic, are more likely to turn away from religion. This is the opposite of previous understandings of the interaction of religion and politics. Social scientists believed that people first got involved in a particular religion, which then influenced their politics in some way. Increasingly, more studies like Campbell and Putnam's are finding, though, that politics is more likely to determine religion than religion determine politics. Campbell likes to use the image of a "brand" from marketing. The Republican brand has been increasingly associated with religion and social conservatism due to the influence of the Christian Right, a social movement which has been a part of the Republican coalition since the 1980s. Moderates and Democrats are uncomfortable with that brand and seek to not be identified with it. "A lot of what goes on in politics is not so much people thinking through political positions but it's sort of a visceral reaction you have to a brand, whether it be Republicans or Democrats," Campbell said. Political conservatives and Republicans, who identify positively with the brand, have been more likely to attend church regularly. Campbell suspects that is due to conservatives being more likely to associate with other churchgoers in their social networks. "You're a conservative, you're around people who are churchgoing, so you begin to adopt the idea that, well, this is what it means to be someone who is conservative, I ought to attend church regularly, I also think of myself as religious," Campbell explained. While these trends were found in the general population, Campbell and Putnam found them to be much stronger among young adults, those under 30, and especially those under 25. "Anything you might say about the general population, double it or square it when you talk about the young," Campbell said. Since young voters are more likely to be politically liberal, especially on the issue of gay rights, they have been driven away from the church by the perception of a close association between religion and Republican politics. Campbell and Putnam report that between 2006 and 2011, the proportion of the population that reported having no religion rose modestly, from 17 percent to 19 percent, but among young Americans rose five times as much. While it has been true that young people of previous generations have been less interested in religion, then become more religious as they become older, today's generation of young adults are more likely than previous generations of young adults to be without a religious affiliation. About one-third of 20-somethings were without religion in 2011 compared to about one-fourth of 20-somethings in 2006. Campbell noted that the trends he and Putnam identified are mostly among those who can be described as "nominally" religious. Those who are the least committed to a church or denomination are the ones who are most likely to drop out. When they do drop out, they are not likely to become atheists. Formerly churchgoing young adults remain comfortable with a belief in God but uncomfortable with organized religion. "The reason this is important for clergy is these are not people who are lost completely to religion. It's almost like they're an untapped constituency, or untapped market, that could be brought back to a different kind of religion, or a religion that they thought was stripped of politics," Campbell argued. There is a trend among nondenominational evangelical congregations that attract younger Christians to avoid involvement in politics. Campbell believes that the pastors of these congregations understand more intuitively what his data is showing more crudely – that young people dislike their religion mixed with politics.